At over 11,000 feet elevation, Yankee Boy Basin near Ouray is a perfect spot for a true Colorado mountain wedding. In July the area is heavy with wildflowers and the scenery for photos is spectacular. There is a great spot for a wedding ceremony near a waterfall and creek that allows for an intimate gathering. The area is only accessible by 4x4, and a company can take up all your guests in comfortable vehicles with amazing views along the way. It's about 45 minutes of driving from Ouray. It's well worth the trip up. In this photo, the bride and groom walked far away to a dramatic point overlooking the mountains. From there they improvised and came up with this dip. I love that there is not much foreground to see, so most of the photo is the mountain backdrop, with the couple looking small at the bottom. The clouds were passing over sporadically, and the cast dark shadows over the hillsides which created a darker canvas for the couple to pop off of. Yankee Boy Basin is located in Ouray, Colorado. 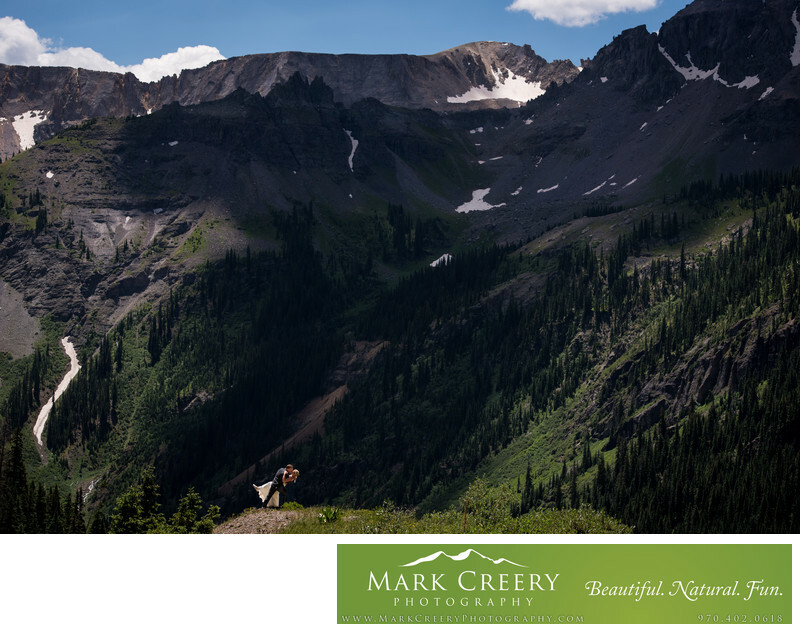 Location: Yankee Boy Basin Road, Ridgway, Ouray County, CO.